A Quick Look at Group Process – American psychologist Bruce Tuckman studied group dynamics, and in 1965, he proposed that every group goes through four stages. I used this model a few times to create plans for global communities which later lead to my “User Adoption Framework”. Specifically when you have the realities of todays organizational dynamics, how do you manage adoption of new process, policy and tools? Think about what has changed over the past 10-20 years, we are global, companies change quarterly, managers have lost visibility and control, departments waffle as people move or are let go. Social networks, functions in SharePoint such as a My Sites, Communities help people discover and network. To Form people must be able to discover and network in ways that Linkedin, Facebook and others enable you to do. The remaining stages require tools such as Meeting Places, Work Areas, facilitation tools (www.grove.com) and communication tools such as phones, email, IM and work sites. Most importantly culture, management support and interaction are key to success, all the tools in the world wont help a dysfunctional company. Forming is the stage in which the group comes together. During this stage, the members get to know one another and begin the process of communicating. Managers (leaders) provide a high degree of facilitation to align and guide the team. Some members might be polite and others might be anxious, but basically everyone is on his or her best behavior. Technologies such as social/professional networking help with forming. People can find people and learn about them helping with finding skills, mentors and succession planning. Company culture influences success, one thats open and supportive is key, post M&A organizations risk stumbling in this area. Storming is the stage when team members begin evaluating their place in the group and struggling to determine the overall work goals of the group. Managers continue to provide guidance regarding roles, demarcation points and direction. Personalities might clash at this point as the group begins to carve out helpful ways to interact. During this stage its important for management to clearly state what each person is responsible for, to outline the demarcation points and hands offs to minimize overlap which can lead to friction and risk. Formalizing and communicating roles openly is critical to success. 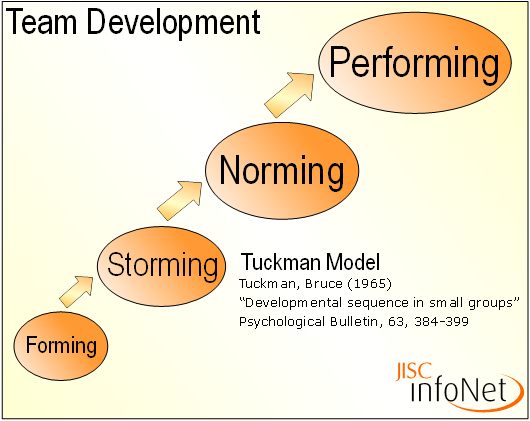 Norming occurs when the group members begin to settle into individual roles that feel like a good fit for the group. The anxiety of testing roles and boundaries calms down, personality differences are less of an obstacle, and the leadership of the group seems suitably established. Through coaching and governance teams and the individuals are guided. If storming is handled correctly the norming will occur faster and with less friction and disruption. Also consider that storming if not managed properly can lead to long lasting damaged relationships. Performing is the stage when the group finally comes together as a team. The group has a shared vision of the final goal of the work and is able to move productively toward that end. Here the employees must know their place in the team, boundaries of execution and activities and when to escalate. To help focus the team I use road mapping workshops, one on ones to establish goals jointly and mentor and monitor over the year. I place a large focus on mentoring and enabling the team – coaching. In 1977 he added a fifth Stage called Adjourning. Adjourning involves dissolution. It entails the termination of roles, the completion of tasks and reduction of dependency (Forsyth 1990: 77). Some commentators have described this stage as ‘mourning’ given the loss that is sometimes felt by former participants. The process can be stressful – particularly where the dissolution is unplanned. In many respects Tuckman and Jensen’s addition of ‘adjourning’ was less an extension of the model, more an after word. The original article was written from the perspective of the functioning group, the fifth ‘stage’ takes us beyond that. Where SharePoint helps is in knowledge capture and succession planning, it provides a repository that others can reference easily with Search or simply browsing the work areas used by the team(s). With the rate of change in organizations today, facilitating team work is key to efficient business operations. Enabling staff to ramp up on their jobs, become proficient, network and become productive as fast as possible is in the management teams best interest. Additionally, capturing the team knowledge in an organized and reusable way is also in their best interests.